One of the best things to do when you visit Downtown Branson is to ride the free Sparky trolley and hop off to explore the many antique shops and flea markets in the district. Down the long, hand-painted hallways at The Classy Flea, shoppers can find collectibles from re-purposed items to primitives and antiques. There are kitchen items, home decor, coins, jewelry, Coca-Cola collectibles and even fishing gear. Located at 107 E. Main Street, the store also offers a large selection of collectible vinyl records. Cadwell’s Downtown Flea Market is at 114 E. Main Street, at the corner of Main and Sycamore. From nostalgic items like vintage postcards to clothing, collectibles and other antiques, this popular market is home to a diverse group of vendors and booths. It’s also a favorite spot for people waiting to ride the Branson Scenic Railway since it’s just half a block from the train station. Riley’s Treasures allows you to shop for unique finds and clean out your closet. The thrift store, located on Veteran’s Boulevard in Downtown Branson, collects gently used clothing, household items, toys, collectibles and more. The store even hosts $1 days and other sales where you can expect to find some great bargains on your treasures! This flea market and consignment shop is located in one of the city’s oldest stone buildings at 106 E. Main St. Originally a church with white columns on either side of the front door, the building was expanded and now includes many antique furnishings and decorations. Specializing in Victorian gifts and collectibles, Patricia’s Victorian House is packed with china, tea sets, dolls, home decor, figurines and more. Shoppers can also find lace-adorned and Victorian-inspired clothing. Patricia’s is located at 101 W. Main Street, at the corner of Main and Commercial Streets. 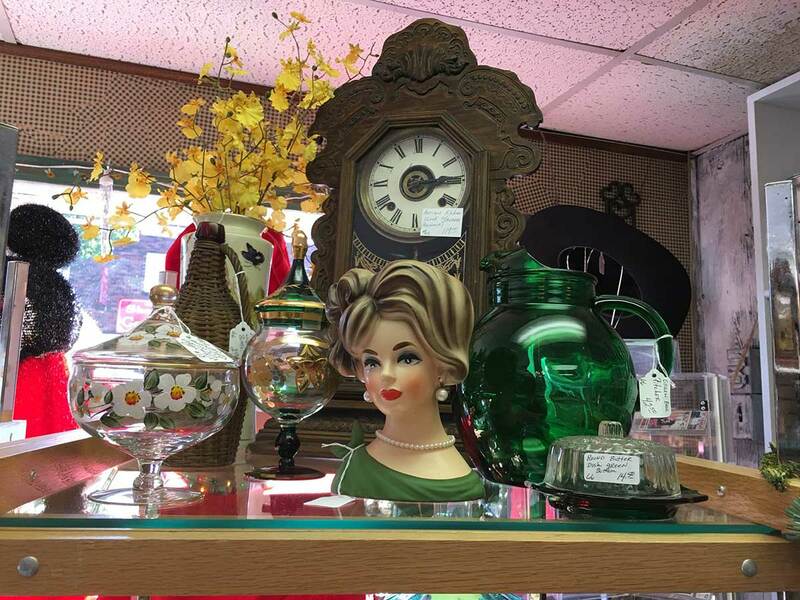 Located at 103 E. Main Street, the Old Town Flea Market has many one-of-a-kind items, including everything from Czechoslovakian perfume bottles to collectible pottery to vintage Native American art. The shop’s collectibles include comic books, coins, jewelry, sports collectibles and vintage kitchenware. Located half a block “uphill” from Historic Downtown is Chicken Coop Antiques, just one block from a convenient trolley stop. Located at 210 W College St., the store features a “big rooster” in front of the store and countless antiques, collectibles and gifts inside. There’s also a large number of old vinyl records that are only $1 each.